Here are 10 useful pieces of information to help you better understand the enrollment process and how to use MFA when you’re prompted to authenticate for the first time. Our web page has more details and links to a user guide and a video on how-to enroll in MFA. If you still have questions about MFA after reading this email, please contact IT Customer Care. They’re happy to help you. 1. Is MFA mandatory? Yes. MFA provides an extra layer of security when you log into a Fordham system. MFA reduces the risk of unauthorized users gaining access to Fordham accounts, thereby protecting your identity and personal information. 2. I can’t find the Duo Security Enrollment email. Duo Security has sent you an email with the subject “Enroll in Fordham University Multi-Factor Authentication (MFA).” Follow the link in that email to set up an account at Duo Security’s site and enroll a phone, tablet, or other device. If you can’t find the email, please double check your inbox and trash folders. Otherwise, contact IT Customer Care. 3. I clicked on the link in Duo Security’s enrollment email and got the message that I’m already enrolled. But I didn’t enroll yet. The link in your email from Duo is unique to you. Once it’s used, it can’t be used again. Use only the link in the email that was sent to you, and don’t share it with anyone. Contact ITCC if you’ve shared your link with someone else who may have already used it for their enrollment. 4. How many devices can I enroll? We recommend enrolling multiple devices, in case your preferred device is not available when you’re prompted to authenticate. 5. What’s the authentication process like? The authentication process takes only a few seconds. The first time you authenticate, you’ll better understand the process and most likely discover that it’s quite easy to do. 6. 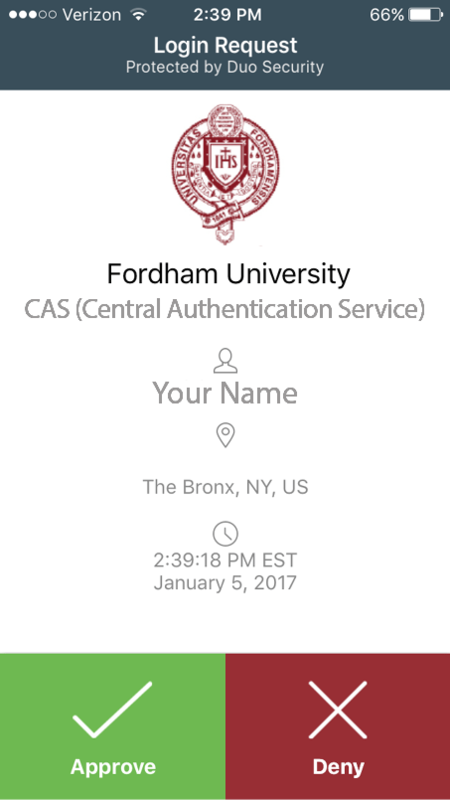 Do I have to authenticate every time I login to a Fordham system? Nope. When you’re using the same device and browser, you can opt to have your authentication remembered for 30 days. You can choose this option when prompted to authenticate. 7. I don’t have a smartphone. No problem. To authenticate, you may use another kind of cell phone, landline or tablet, instead. 8. I don’t want to enroll any device or phone with Duo. Contact IT Customer Care to discuss alternative ways (such as a hardware token) to participate in multi-factor authentication. Duo can be used without an Internet connection or a data plan. No matter where you are in the world, whether you use a mobile device with the Duo app or a hardware token, you can get a passcode for authentication and finish logging into a Fordham system. In addition to the ways of using a passcode cited under “What’s the authentication process like?,” above, batches of ten passcodes can be texted to you in advance of travel. Each passcode can be used only once. 10. What happens if I refuse to enroll in MFA? If you don’t enroll in MFA, you will not have access to any services you normally access via My.Fordham, VPN, or MyDesktop. Contact IT Customer Care to discuss how to successfully integrate MFA into your regular work routine. Thank you for your cooperation in helping to make Fordham University a safer and more secure place for all.